Description: NS SD60E 6914, rebuilt from NS SD60 6534/HLCX 5950 in the middle on 20K. Description: NS SD60E 6914 trails in between two Dash 9s on 14G as it moves through West Lang. This unit was rebuilt from NS SD60 6534 Ex HLCX/CRIX and UP 5950. Description: This is when my camera failed as the circus train was coming through. Title: NS 6914 trails 2nd out!!! Description: 18N roars through Macungie with NS ES44AC 8056 leading yet another SD60E. Description: M1J (extra 11J) passes a finally underway H2W. Description: Grabbing about 15 cars to add to their train. 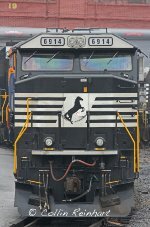 Description: NS Westbound Freight Train 153 ( Linwood, NC to Birmingham, Al. ) rumbles through Douglasville, Ga. with an IC SD70 leading the way.